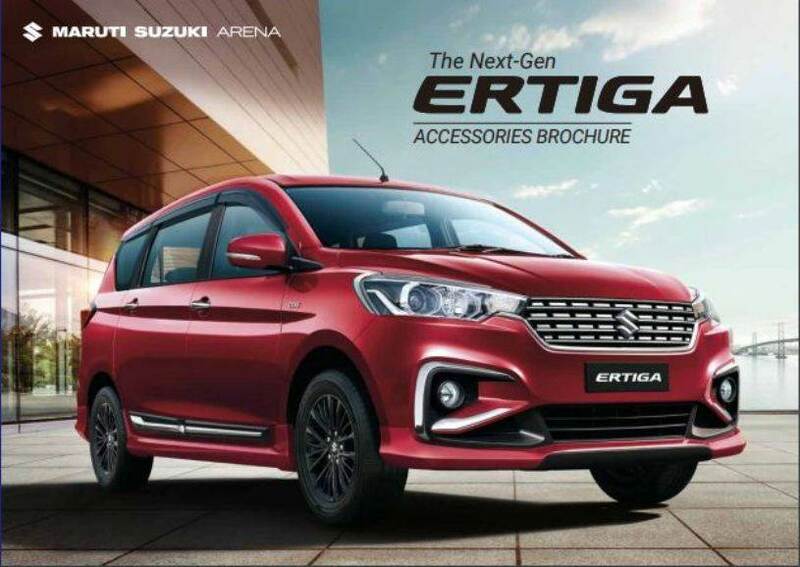 Update: 2018 Maruti Ertiga official accessories brochure images added to the image gallery at the bottom of the post. The 2018 Maruti Ertiga was launched on 21 November and is on sale in a price bracket of INR 7.44 lakh to INR 10.90 lakh. 2018 Maruti Ertiga accessories list includes two styling packages and a range of individual add-ons. The Heartect based people mover is better equipped than its earlier iteration and comes with a range of standard features, including dual front airbags, ABS with EBD, tilt adjustable steering, projector headlights, central locking, and LED tail lights. Moreover, buyers can further jazz up the MPV through selecting from a range of official accessories from the company. The company is offering two optional packages - Ambitious and Indulge. These comprise many add-ons for the car's exterior and interior. Other than this, the owners can even pick specific accessories for their vehicle. The accessories packages are particularly useful for owners of the lower trims, who can add bits like faux wood trim, alloy wheels, and reverse parking camera, to enhance the overall appeal of their vehicles. Moreover, the company has even listed a sequential CNG kit as an accessory for the petrol-powered Ertiga. It may be noted that there have been reports of the second-gen Ertiga receiving a CNG variant in the coming months. The Ambitious Package includes a rear upper spoiler (INR 7,199), bumper corner protectors (INR 867), window frame kit (INR 3,763), body side moulding with chrome insert (INR 4,213), window frame kit (INR 3,763), designer mats (INR 1,190), steering wheel cover, reverse parking assist in IRVM, tissue box and box finish lining seat covers (INR 11,432). The Indulge Package features rear bumper garnish (INR 1,563), body side moulding garnish finish (INR 3,603), window frame kit (INR 3,763), nautical star finish seat cover (INR 11,432), deluxe carpet mat (INR 1,790) and interior styling kit for armrest bezel with maple wood finish (INR 9,169). Other than this, you can also choose from a range of individual accessories, including door sill guard with illumination, fog lamp garnish, wheel covers (INR 2,036), 15-inch alloy wheels (INR 32,220), Rear spoiler + side skirts + rear spoiler (INR 33,660), Door sill guard with/without illumination (INR 1,626/INR 3,844), Fog lamp garnish (INR 2,133), Door handle garnish (INR 1,903), Reverse parking aid with 4 sensors, IRVM display and camera (INR 15,680), Security system with sensor (INR 7,370), Body covers Normal/Premium (INR 1,890/2,999), Premium art leather seat covers (INR 12,732), Dashboard styling kit (INR 8,369), Registration plate garnish (INR 986), 1,000 Watts Sub Woofer (INR 20,360), Car perfume (INR 350), Premium car care kit (INR 1,474) and Speed governor (INR 15,000). The new model is available in two engine options - 1.5-litre K15B (105 PS/138 Nm) and 1.3-litre D13A (90 PS/200 Nm). The second-generation of the Swift-based MPV is 99 mm longer, 40 mm wider, and 5 mm taller than its predecessor, while its wheelbase, at 2,740 mm, remains unchanged.